Prepare cake mix as directed on box. Line each muffin cup with a white paper cupcake wrapper in your temp-tations® muffin pan. Fill each one 2/3 full with cake batter. You will need to bake these in two batches and will have some batter left over. Use baking temperature and time guidelines on the cake mix box. Cool completely before decorating. Prepare the brownie mix according to package directions. Line your 13" x 9" temp-tations® baker with parchment paper, leaving a little to hang over each short end. Pour batter into baker and follow the baking temperature and time guidelines on the box. Cool completely before lifting from baker. Place the coconut in a small bowl. Add a few drops of green food coloring and toss to coat. This will be used for the lettuce. 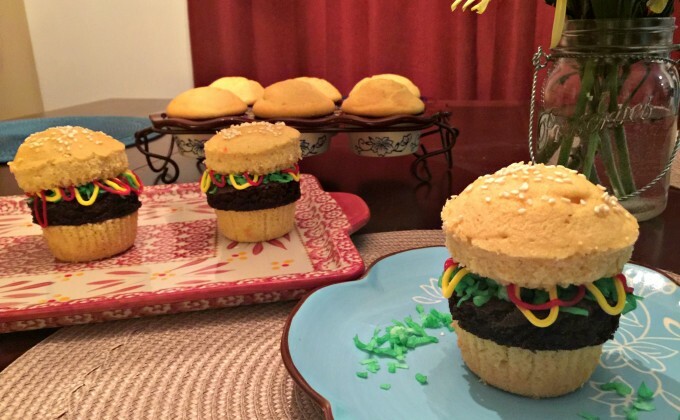 To assemble, trim the top edge off of each cupcake to make it look more like a hamburger roll. Remove wrapper and cut each cupcake in half horizontally. Use a round cookie cutter to cut the brownies the same width as the cupcakes. Place one brownie disc on top of each cupcake bottom. Sprinkle some of the green coconut over the brownie. Drizzle some of the yellow icing (mustard) and red icing (ketchup) over the lettuce. Set a cupcake top on each one. Using a pastry brush, lightly brush the top of each one with water. You can also use a spray bottle. Sprinkle some sesame seeds on top. Serve immediately or refrigerate until later.